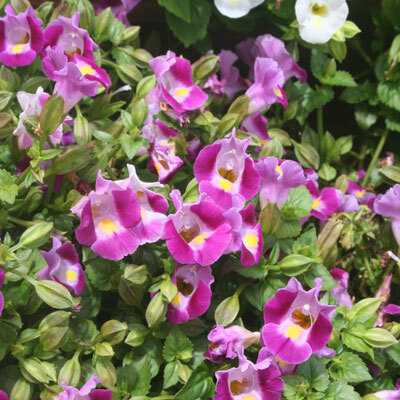 Torenia Catalina™ provide a good effect as low growing borders in gardens or pots near the home. On patios or near barbeques you could use Catalina™ in selected pots as part of your outdoor décor. Catalina™ are low growing compact hybrids of Torenia Fournieri and do as well in shade, semi-shade and even into full sun. Splashes of colour are always welcoming. Use Catalina™ to good effect as low growing borders in gardens or pots near the home. On patios or near barbeques you could use Catalina in selected pots as part of your outdoor décor. They grow well in decorator pots, garden beds and hanging baskets. Reliable garden performance has given Torenias a well deserved reputation with home gardeners all over the world. Well draining soil, which holds moisture is best for their cultivation either in pots, baskets or garden beds. Prepare the media by adding compost and working it into the top soil. They are one of the few flowering plants that will do well and flower heavily in shade. Preferred position would be in partial shade. Weak applications of liquid fertilizer at monthly intervals throughout the season from September till May gives better growth, more flower and larger flower. Flower size is larger and brighter in shade. Plants grow to around 20cm in height.Aside from an odd chewy grub we have not seen any real problems with insects or in fact other diseases. Torenias, in nature come from the warmer areas of Africa and Asia. There are some 50 species, named for Reverend Olaf of the Swedish East India Company in the mid 1700?s. Some annual forms such as the fournieri hybrids have been used in European gardens since the 1800's.